Canadian Malartic, Canada’s largest operating gold mine, is located in Quebec, Canada. Accurate monitoring of blast movement helped Canadian Malartic recover 217,000 tonnes of ore, valued at $7 Million, in Q1 2018. An example blast, shown right, demonstrates how monitoring blast movement recovers more ore.
4. Calculated at a gold price of CA$1,800/oz. 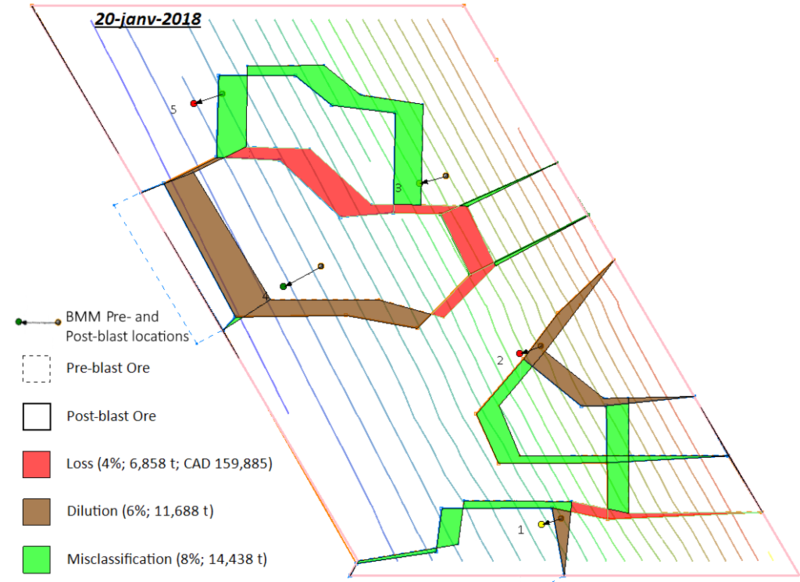 In this blast, Canadian Malartic avoided the potential loss of CA$159,885 (4% of ore was not sent to waste) and prevented 6% dilution (11,688 tonnes) and 8% misclassification (14,438 tonnes).